Milestone Films has released, for me, the best DVD for 2007 - one of my favourite films of all time, “I Am Cuba” . It’s a lost masterpiece – a collaboration of Soviet and Cuban filmmakers dramatizing the Cuban Revolution. With some of the most astonishing visuals ever put to screen then or since, it’s mandatory viewing for all lovers of visual cinema. 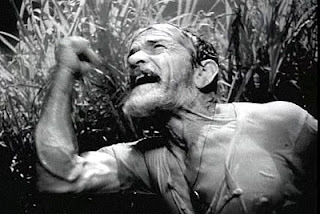 “I am Cuba” was filmed over two years as a co-production between Mosfilm (USSR) and ICAIC (Cuba), by acclaimed director Mikhail Kalatozov (“The Cranes Are Flying”), his cinematographer Sergey Urusevsky and a Cuban cast. This unique collaboration of Slavic methods and Cuban values resulted in a visionary film about the passion of the workers who rise up against the oppression of American Imperialism and reclaim their dignity as the salt of the earth. The story is told in four distinct vignettes during the Batista-ruled period just prior to the Revolution. The first is the story of a demure Cuban prostitute who picks up her men in a nightclub catering to deep-pocketed American businessmen. The second story shows the depressed lifestyle of a poor Cuban sugarcane farmer who loses his land to a wealthy and unscrupulous landowner. The third depicts a young revolutionary who rises up and leads the students in a violent demonstration against the corrupt Batista-police. The final story shows the battle in the mountains where Castro was hiding and first started his military coup. A humble farmer, who rejects guns and violence is forced into battle when his son is killed by a bomb. The stories are connected by one or two characters that appear in several of the vignettes, but for the most part they are autonomous stories linked by a common theme of passion and love for land and country. The film uses the power of the image and editing to contrast the decadence of the Batista-era society with the squalor of the Cuban people. The star of the film is the Kalatozov’s camera, which is freed from all constraints of mainstream cinema. As Martin Scorsese explains in his introduction to the DVD, with the endless time, money and creative freedom Kalatozov and his brilliant cinematographer Sergey Urusevsky essentially rewrote their own rules of cinema. Each scene is build around a series of long takes that move the camera forward, backward, up walls, into swimming pools, and through the air. But the film isn’t about fancy camera movement, Kalatozov’s eye finds more awe-inspiring frames in one film that most filmmakers would be lucky to find in a career. Unfortunately, despite its greatness, the film has never received the historical acclaim or stamp of approval as, say, “Rashomon”, “Breathless” or “Fellini’s 8/12”. There is a reason. The story behind the making of “I Am Cuba” is as intriguing as the film –documented in a wonderful self-contained feature film, “The Siberian Mammoth” which accompanies the gorgeous cigar-box-themed box set. When the film was released in Cuba and the Soviet Union in 1964 for cultural and political reasons both countries hated the film. Therefore the film was shelved and never seen again until it was rediscovered after the end of the Cold War. Other than a couple screenings in Cuba and the Soviet Union, the film had never been seen by anyone. Since its re-discovery in 1995, the film has gradually been exposed to audiences – via the first Milestone DVD/VHS release, various Cinematheque programs, and film school courses as an example of propaganda cinema. Slowly the influence of “I Am Cuba” can be seen in today’s films – watch for its inspiration in “Boogie Nights, “Thin Red Line” and “Children of Men”. Mikhail Kalatozov went on to direct one more feature after “I Am Cuba” – “The Red Tent (1971)” – a fabulous adventure film with Sean Connery and Peter Finch. Sadly he died in 1973 at a time when he was at his artistic peak. His name is never referenced in discussion of the great auteur directors of world cinema. But he is a true master of cinema and is as relevant as Godard, Fellini, or Kurosawa. Please watch this film as well as his others. Read my review of Mikhail Kalatozov’s “The Cranes Are Flying". The story is told in four distinct vignettes during the Batista-ruled period just prior to the Revolution. good story thanks. I'm not sure what your comment is about.Can you explain?